The expression was supposedly keyed by Francis Bacon in the 16th century, so it is strange that something that probably held credence about 500 years ago should still remain a received idea today. Knowledge was brokered at that time, and jealously guarded by the clergy and the nobles – their knowledge, or perhaps the other way around, their power, was ensured by the knowledge that they retained within a closed, elite group. Just think about it for a minute, especially in the light of the fact that the whole content of Wikipedia can be downloaded onto a smartphone – where is the power there? Anyone, at a click of a mouse, can access huge amounts and varieties of data – the interesting point is, that, more and more of this information is user generated – long live social media and the semantic web – Web 3.0! Today this is surely not the case, there are certainly those that hoard and covet information (a small minority in my opinion) but the vast majority, share information through the various channels and especially by way of social media. A few minutes ago, I shared a link that I found on Internet through Twitter, this was the results that it threw up – Retweet reached 16,673 people via 3 tweets and that is only the start as it will surely keep going over the next few hours. Now, I’m sure there are many who will totally disagree with the statement, knowledge is no longer power, I imagine that purchasing managers, to name but one group, feel that knowledge is, indeed, power during a negotiation with a potential supplier. Others will point out that mankind has dominated all other species who were superior in strength, speed and size through knowledge used as power. And therein lies the key – knowledge is of little use unless it is put to use and acted upon. 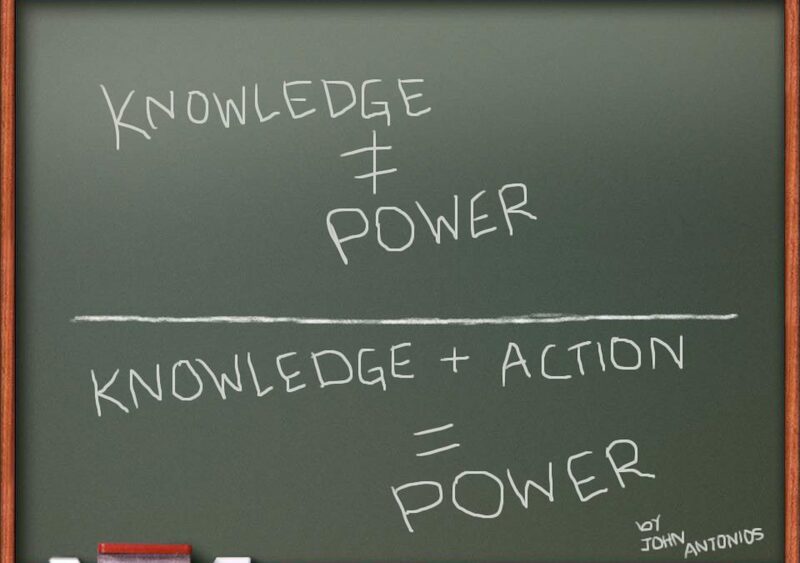 There is undoubtedly a connection between knowledge and power, but it is the application of knowledge that is the catalyst of power. Anyone, as we have already recognised, can access knowledge, but this does not necessarily open doors to power, in any connotation of the word. Knowledge is important but if there is no action to validate and put it to use, then, frankly there is just no point. Estimates regarding social media – which change rapidly, state that only about 4% actually produce content through writing blogs etc., whilst around 11% amplify by retweeting on Twitter, or liking on facebook and a massive 85% consume this ‘knowledge’ by reading or accessing the information. This does not necessarily mean that 4% hold the power, although through time, we could perhaps substitute the word ‘power’ for ‘influence’, which ultimately, is one of the vital organs of power. It is more a case of what we do with the knowledge that we have that is the key – and very few have this key, for whatever reasons. If you are sitting in the middle of the road and you can hear a truck in the near distance bearing down on you – then it is of little use knowing that if you do not move you will be crushed, if you don’t get up and move out of the way. Ideas are worth nothing. Implemented ideas are everything, and implementation is a lot harder than the dreamer in the bar realises. As Seth Godin puts it: you’ve got to ship it.